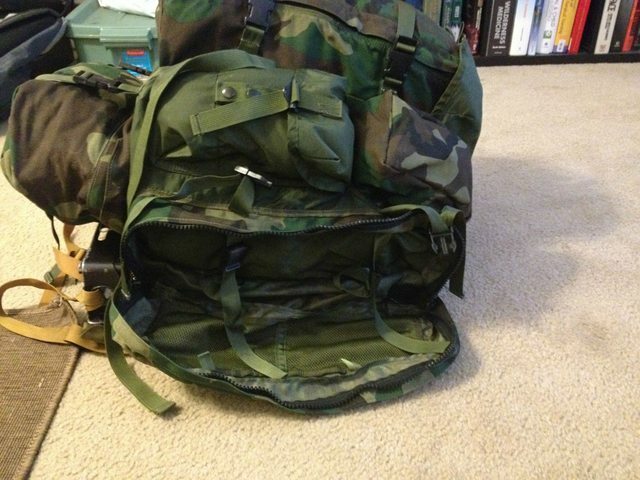 Looking for a specific aid bag. Discussions of the best (or worst) equipment to have on hand for use in the event of an injury during an emergency. If you know of an aid ruck that is equally gargantuan, that would be fine too. I'm fairly certain, however, that such a thing does not exist. 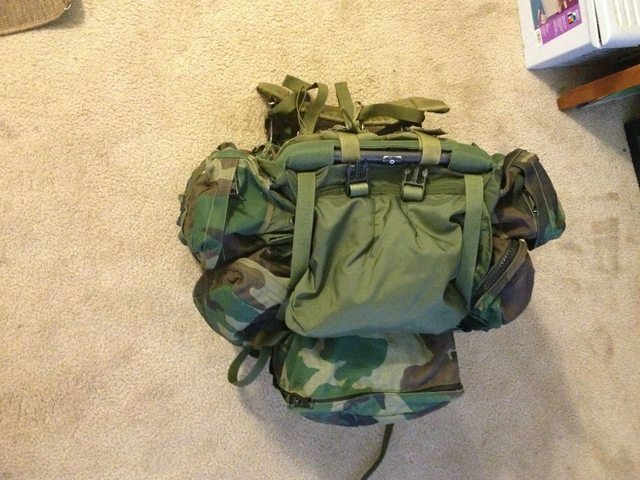 Re: Looking for a specific aid bag. I have something large, but probably not as baller as an SAER pack. It's an ALICE that was heavily modified, reportedly by Tactical Tailor for a PJ. I don't know how true that is, but it's a solidly built pack. (If anybody has any additional info on this pack, I'd love some history) Note that the load-out shown is simply for perspective of scale. I load it specifically for whatever I'm doing, and keep it empty otherwise. From what I can tell, it's got the 5 pocket modification, where pocket #2 and #4 are standard small zip pockets above the normal ALICE pocket. 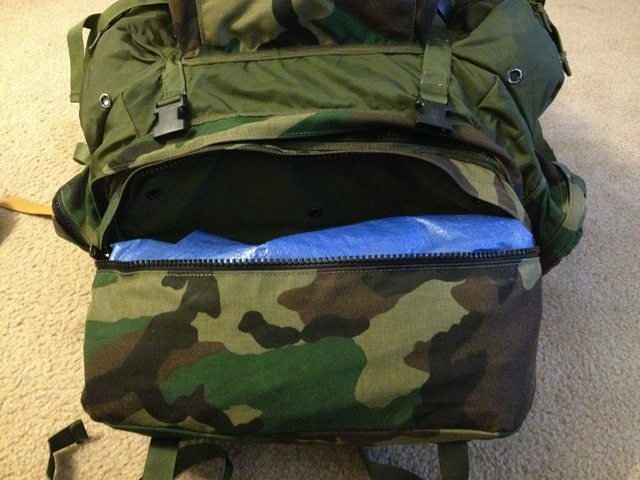 There's also a zippered opening in the bottom to access the main compartment, and a pouch under that that will take a compressed sleeping bag, blankets, tarps, or a roll up litter. The #3 pocket is set up with three divided compartments (I added a galls pull bag to each to show size) and three organizer flaps. The large mesh side flap holds a large trauma dressing/burn sheet, and the two smaller mesh compartments fit 4x4 or 5x9 with room to spare. This is the bottom compartment I mentioned earlier. I do not know much about the SAER pack, but shy of trying to bring out an entire OR, there's nothing I could think to pack that I couldn't fit in this ALICE. Heck, a loaded STOMP II fits in the main compartment if you want to just go full blown silly. The only things left I would change would be to send it back to TT for a claymore pocket on the flap. If you look, there's a set of fastex buckles on the top, my guess would be for a smaller aid bag, which I don't have a need for, so I would prefer to use the space for further storage. I also would eventually like to upgrade the carry system, either with a NICE yolk, or an HSGI Ali pad, if I can find one. My point being, for what you'll probably pay for an out of production mystery ranch pack, I'm betting you could get something built to your exact specifications. My posts are my opinion, and do not reflect the standing or policy of any group I may be associated with. Nothing typed here should be considered medical advice, or permission from myself or any governing body to perform medical intervention. If this is a medical emergency, please get off your computer and dial the appropriate local response number. Well, my plan was to clone my trauma attending and just shove him in the main compartment. The OR goes in the STOMP II. In all seriousness though, thats a pretty slick rig. Im still trying to find even a shred of a lead for a SAER pack, as I dont know of anyone who does that sort of work. I would try http://www.tacticaltailor.com/index.aspx, they do pack modifications, if you were willing to spend the money, I am sure you could order some non-standard modifications, or a base pack other than the ALICE. Just out of curiosity, do you have a specific trip/expedition/function you want this pack for? Or are you just looking to buy the pack now for later use? Im getting into USAR, and likely some true contract wilderness work. So the idea of one profoundly gigantic ruck that holds everything (up to and including the aforementioned attending) is appealing. 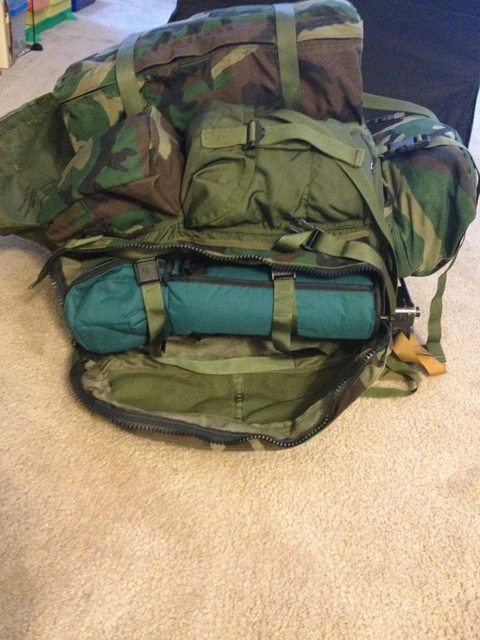 I dont actually plan on carrying it much, other than rucking it to wherever it will live. For everything else, theres conterra. Parameducated wrote: Im getting into USAR, and likely some true contract wilderness work. So the idea of one profoundly gigantic ruck that holds everything (up to and including the aforementioned attending) is appealing. 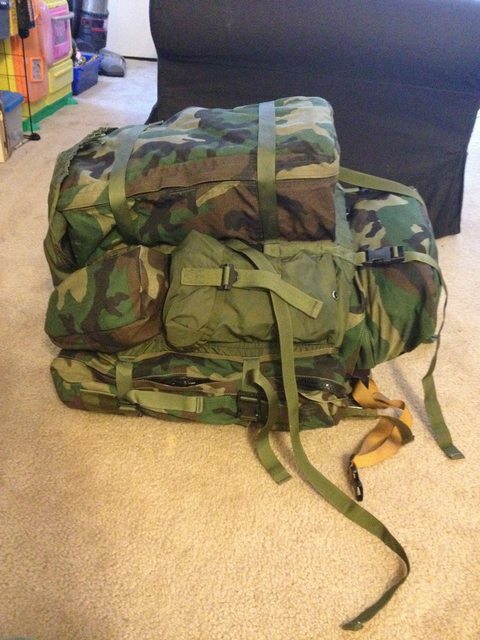 I dont actually plan on carrying it much, other than rucking it to wherever it will live. For everything else, theres conterra. I understand that completely. Honestly, for that (and if you were really hung up on having it be a Mystery Ranch product) I would almost go with something big and empty like a NICE 7500 BVS. If anything, it would discourage you from loading the thing up and trying to hit the trail for SAR or Wilderness med, and use it only for load hauling to and from base camp. EBAY even has MR pullpacks on sale (color coded or IV) that you could use for some standardized modularization. Also, with some quick googling, there are shops all over that will do custom bags. For what you'll pay from MR, especially out of production gear, custom might be the way to go (more so if you incorporate an established carry system, like the NICE frame or something akin to that). You probably already tried this, but did you try to call MR and see if they will build you one? I've bought numerous packs from them over the years and they used to do custom work/changes etc. They might be able to build a custom one for ya as a one off based on the previous design. I tried :/ unfortunately they can't. I'm looking for someone who can do a really good custom pack at this point. How about a Blackhawk SOF Ruck mounted on a Mystery Ranch NICE frame? VXMerlinXV wrote: I have something large, but probably not as baller as an SAER pack. It's an ALICE that was heavily modified, reportedly by Tactical Tailor for a PJ. I don't know how true that is, but it's a solidly built pack. (If anybody has any additional info on this pack, I'd love some history) Note that the load-out shown is simply for perspective of scale. I load it specifically for whatever I'm doing, and keep it empty otherwise. Thank you, I was really lucky to come across it. I would definitely recommend going this route for anyone looking for anything bigger than a STOMP II. I eventually want to put it on an upgraded frame/carry system. I found my aid bag. Its custom, bright red, excessively large, and far too awesome to describe prior to its arrival. Prepare yourselves, for the most ridiculous aid bag the world has ever seen. 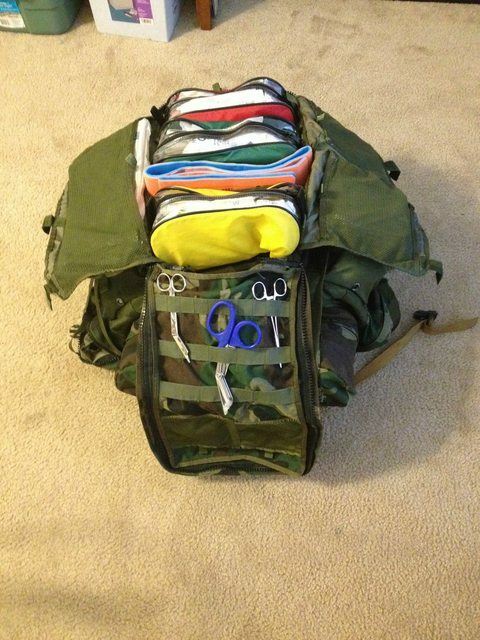 Parameducated wrote: I found my aid bag. Its custom, bright red, excessively large, and far too awesome to describe prior to its arrival. Prepare yourselves, for the most ridiculous aid bag the world has ever seen. Yeah, please follow up with pics, order info, etc. thats the plan. 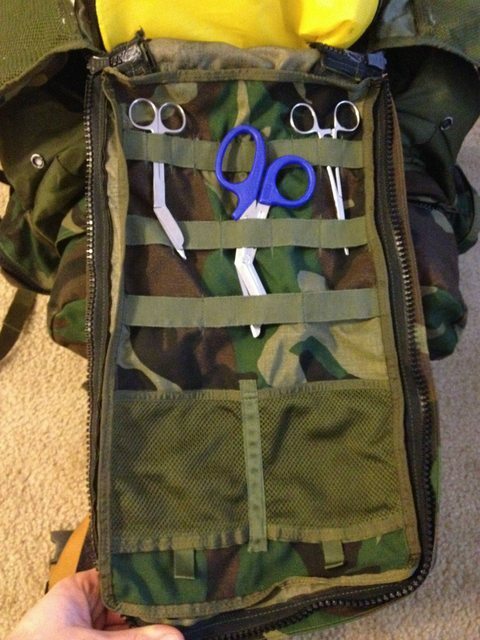 tactical tailor gave me an estimated 8-10 week lead time, so its going to be a while. Man, I should get a commission. VXMerlinXV wrote: Man, I should get a commission. I'm curious, how much gear/supplies do you think you'll need to bring on a SAR operation? I have no working SAR experience but I've known and worked with numerous SAR volunteers and they would never plan to bring enough medical gear to need the sort of packs I've seen in this thread. What sort of operations require that much gear in the field? Honest curiousity, not trying to stir up anything, trying to gain some knowledge. I work as a Medic in the film industry and bring quite a bit of stuff with me on remote jobs but I can't imagine needing that much medical gear and having to carry it for any sort of distance. "There are two novels that can change a bookish fourteen-year old's life:The Lord of the Rings and Atlas Shrugged. One is a fantasy that often engenders a lifelong obsession with unbelievable heroes, leading to an emotionally stunted, socially crippled adulthood, unable to deal with the real world. The other, of course, involves orcs." I will be working in contract wilderness medicine, with this kit acting effectively as a mobile ICU, save for the monitor. I would not be using this pack for usar, other than filling with all the crap I might need on a deployment. The only time I'll be putting miles on the pack is when I deliver it to basecamp. JohnE wrote: I'm curious, how much gear/supplies do you think you'll need to bring on a SAR operation? I picked up my bag as an option for carrying a more extensive array of medical supplies as well as all of my hiking or camping gear. Not so much for search and rescue, but as a more extensive medical support option on longer hikes with larger groups. I guess what I'm not understanding is why you'd need a medical bag to transport supplies. 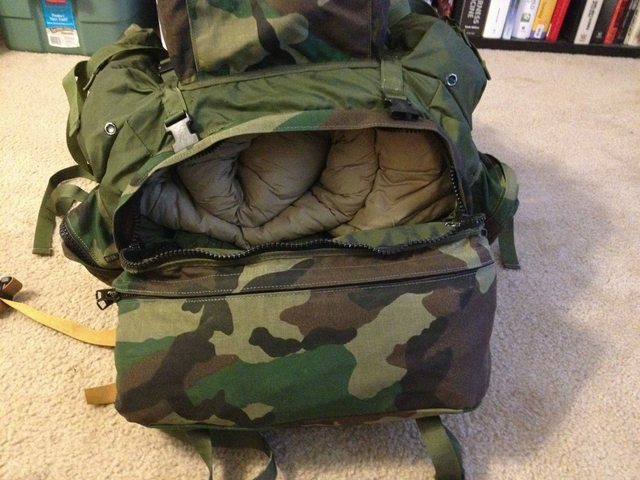 Seems like any old backpack would carry the supplies just as easy and at a fraction of the cost. Especially if you'll be using Conterra bags for the actual medical work. I use Pelican cases to store and transport my gear and supplies via my vehicle and once I'm at my work location I use trauma bags to work out of. JohnE wrote: I guess what I'm not understanding is why you'd need a medical bag to transport supplies. 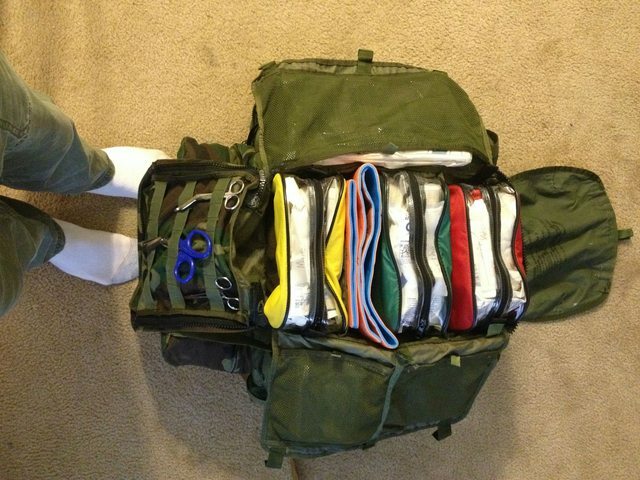 Seems like any old backpack would carry the supplies just as easy and at a fraction of the cost. Especially if you'll be using Conterra bags for the actual medical work. This is a really solid point.